Pick has white hair and didn't develop his sturdy bottom sitting behind desks. 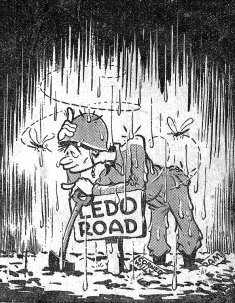 He developed it traveling up and down the Ledo Road in a jeep, telling the boys with the hairy ears that they had to get so many miles done that day and damn the rain, the jungle, the mud, the mosquitoes, the mountains and the consequences. Late communiqu�s tell of twin Jap offensives aimed to widen the protective ring around Hong Kong and to close the Chinese-held gap in the Canton-Hankow Railway. Initial Jap successes were reported. 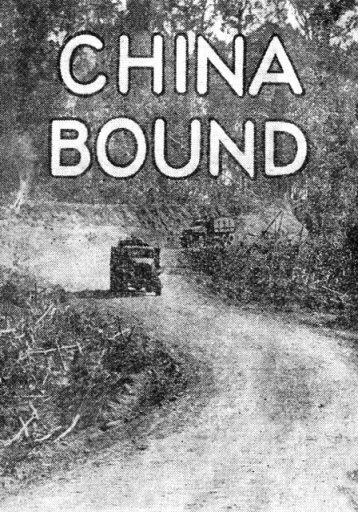 "When the first convoy over the Ledo-Burma route entered China a great goal was achieved. Every unit in the India-Burma Theater, Ground Forces, Air Forces and Service Forces, American, Chinese, British, India and Kachin troops, has made its contribution to that achievement. Your magnificent work has been hailed by all the United Nations and will long be remembered." The convoy's defense unit, an elite of Ramgarh-trained Chinese soldiers, had its roll call, then one by one the men crept into their sacks. S/Sgt. 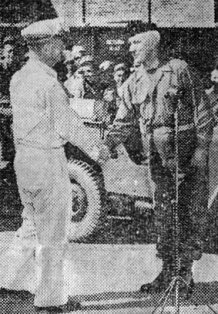 Robert B. Goodman, the driver of the lead truck and acting first sergeant of the convoy personnel, seemed very proud to drive the first 6x6 into China. "It's quite an honor, I guess," I heard him say. Two colored drivers were discussing a guy who offered them 1,000 Rupees if he could drive to China instead. The colored corporal who drove the jeep in which I was traveling was going to write his old farmer father a diary of the trip if censorship permits. CHINA - As the first convoy to China proceeded along the Ledo Road 15 minute breaks would be taken. 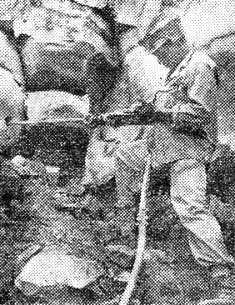 In the Hukawng and Mogaung Valley campaigns, combat roads were cut by Engineers operating armor-plated equipment. 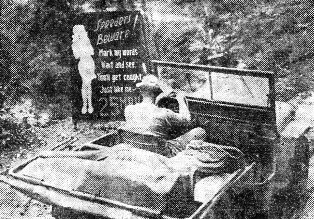 Troops and supplies moved on south into Burma through the jungle to the battlefields at Ningam Sakan, Taipha Ga, Maingkwan, Walawbum, Tingwaukm Sakan, Jambu Bum Pass, Shadazup and Warazup. The ride from the West gate, after Gen. Lung Yun, Governor of Yunnan Province and official representative for Generalissimo Chiang Kai-shek, cut the ribbon officially opening the Stilwell Highway, was an experience no one on the convoy will ever forget. The crowds were alive with color. Chinese, American, British and Russian flags fluttered on all sides. School children proudly waved vari-colored paper flags bearing Chinese inscriptions. And each of the convoy vehicles was decorated with Chinese and American flags and red, white and blue ribbons. In the city, people clung to balconies and leaned out of windows. Flower peddlers swung their colorful wares high above the heads of onlookers. Rickshaw men stood by their rickety carts on the side streets and looked on with wondering eyes. And all along the way the crowd grinned and chanted "ding how" as each vehicle passed slowly by down the stone streets. An official ceremony at the West Gate preceded the parade through Kunming. And, before the ceremony began, Lily Pons, American opera star and her husband, Andre Kostelanetz, famous composer, both of whom are touring Army installations in China, Burma and India, were introduced to Pick. 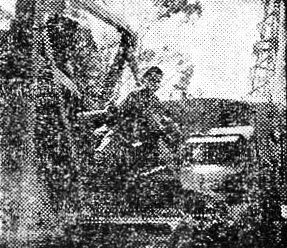 Forty-odd war correspondents and photographers - American, Chinese, English, Australian and Indian - besieged the Public Relations Officers of the I-B Theater for background information and release dates. Many distinguished correspondents who usually did not make Myitkyina their headquarters flew in for the occasion. You saw Til Durdin of the New York Times, Teddy White of Time and Life, Al Ravenholt of United Press, Jim Brown of INS and the young Australian writer, George Johnston - just to name a few. And there were the soldier-correspondents, three different radio teams, Signal Corps photographers, War Department cameramen, official British and Chinese newsreelers and the representatives of the Office of War Information and the State Department. The coming event was the climax of our activities in this part of the world. Gen. Joseph W. Stilwell's bold dream, carried out by Lt. Gen. Dan I. Sultan, was soon to be attained. A land route from India to China was waiting for the first convoy. In an official release the following facts about The Road were disclosed: The 478-mile highway was built at a rate of about one mile per day through some of the worst jungle in the world and over 4,000-foot mountain passes. During one seven-month period, 175 inches of rain fell to hamper the work. By comparison, eastern States of the U.S. average less than 45 inches per year. 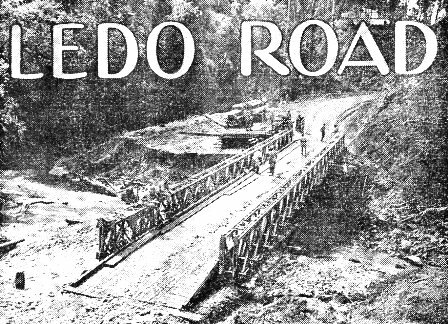 Approximately 70 acres of airstrips were built at points near the Ledo Road. The Road's builders moved a total of 13,500,000 cubic yards of earth. It would take a string of railroad cars 470 miles long to transport the 1,303,000 cubic yards of gravel spread on The Road. To top it off, there's an average of one bridge to every three miles of The Road. So, take a well-deserved bow boys. 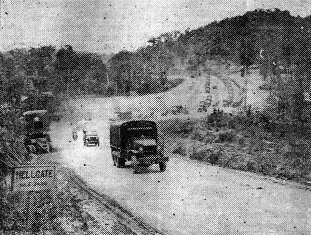 Volunteers in Services of Supply, India-Burma Theater, can now apply to their commanding officers for permission to drive convoys to China over the new Stilwell Highway, it was stated this week by Lt. Col. Allen C. Bigelow, chief of the Transportation Section, Transportation Service, SOS. Bigelow says SOS needs men to drive the supply convoys to Kunming with the initial deliveries scheduled this month. He urges men desirous of volunteering to see their commanding officers without delay. After arrival in Kunming the drivers will be flown back to India-Burma Theater. Volunteers must be experienced drivers of vehicles having a capacity of two and a half tons or more. The selectees will be given a 15-day refresher course and then will be examined by the cadre men of Brig. Gen. Lewis A. Pick's Motor Transport Service at Advance Section No. 3, SOS, where the convoys are assembled. It is planned to send out separate convoys manned chiefly by men and officers from the same organization. Bigelow stated that the men will be under jurisdiction of the India-Burma Services of Supply Forces even when they are in China.